Guy nodded a greeting to a smiling foreman. He detected the smallest glow of self-esteem. Or maybe it was nothing but his new suit, he thought, only the third suit in his life he had ever had made for him. Anne had chosen the grey-blue glen plaid material. Anne had chosen the tomato-coloured woollen tie this morning to go with it, an old tie but one that he liked…. Guy sipped his martini thoughtfully, holding the surface perfectly steady. observations: Well Highsmith’s not frightened to put a serious meaning on a slight framework is she? From the new suit to death on the brain in a handful of words. And the sentence about the martini, a chapter ending, is terrific, although can you really drink anything while holding it steady? The third custom-made suit is another Highsmith-ian detail. Is it meant to show his exact social position? He is very obviously going up in the world by marrying Anne, but not that far – most writers would surely have made it his first good suit. It can be hard to get to grips with Highsmith, she’s a bit of a take-it-or-leave-it writer. A suitable jubilee anecdote: it is alleged that the Queen Elizabeth would be supplied with a bagful of detective stories every year before she went on holiday, and that one year the edict came through - No more Highsmith. Ever. It’s not often that we have (or would want) anything in common with Royalty, but maybe this is the time. PH was a very talented writer, had amazing abilities, but her characters and situations are very gloomy, there are no jokes. Links up with: Georgie gets a new suit in this Lucia book, and the men are dressing up for a wedding here. 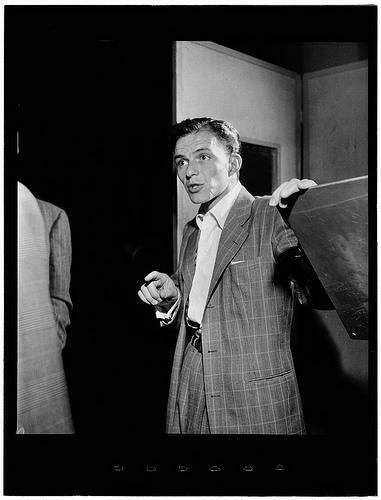 The handsome chap in the plaid suit is a young Frank Sinatra: the photo is from the fabulous Gottlieb collection of jazz pictures at the Library of Congress.